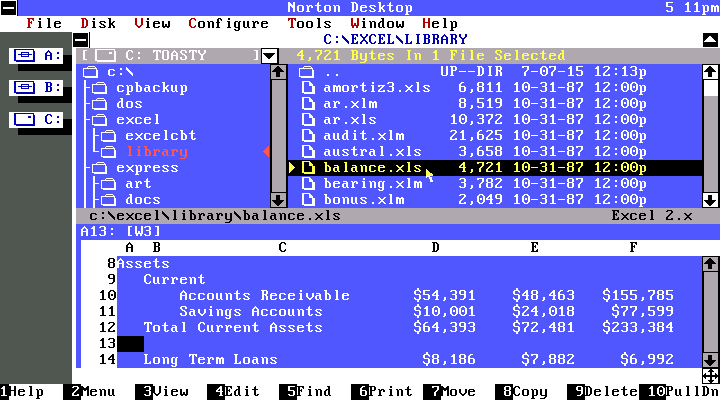 Norton Desktop for DOS is a vaguely Mac-like file manager shell and accessory set that uses a text-mode user interface. It runs on any 8088 or higher based IBM PC compatible with at least 512K of ram, 4-8MB of hard drive space, DOS 3.1 or higher, and supports MDA, CGA, EGA, and VGA text modes. It can be operated with a keyboard or a mouse. 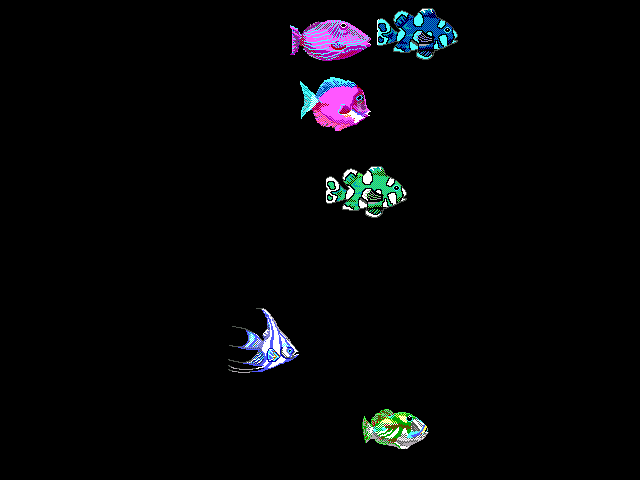 Similar to other DOS based Norton products of the time, on compatible VGA displays, it uses a custom character set to provide some "graphical" symbols. It is not a multitasking environment, and must shell out to DOS to run applications. The desktop shows each drive on the system as a drive letter on the desktop. If you are using a mouse, you may click on one to open a file window. 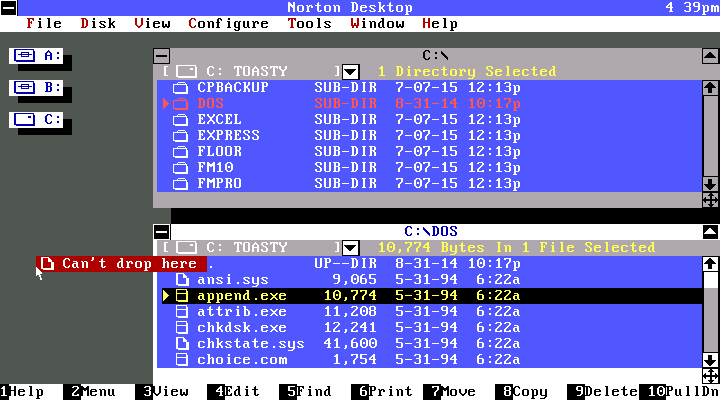 A menu at the top of the screen offers numerous file and system management options. At the bottom, a "Button Bar" lists common function assigned to keyboard function keys. There is no "icon" or "list" view. Each file window may have an optional Tree Pane, and/or a View Pane. Only a Tree Pane can be displayed without the File Pane. There is an advanced option to hide individual file details (icon, size, time, and date), that makes it look like a list view, but this applies globally to all open file windows. It is not possible to put files or anything else directly on the desktop. Although it is not obvious, it is possible to drag icons to the "Button Bar". For example, dragging an icon to "Delete" will prompt you to delete that file. 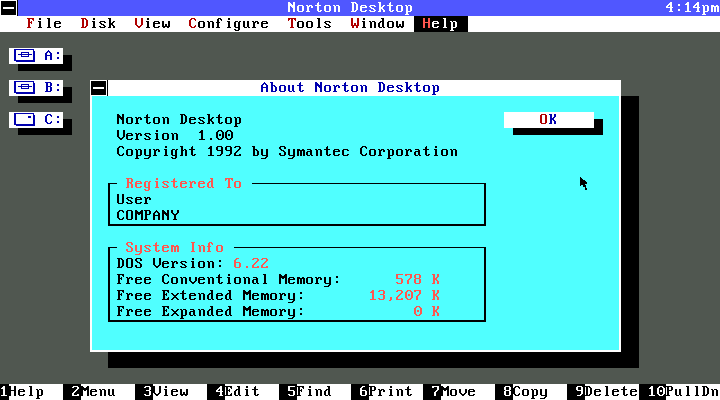 The view menu has an option to refresh, useful for multitasking or network environments. The View Pane can preview a number of document types, including word processing documents, spread sheets, and compressed archive files. It includes a search tool that can search by filename or by content. 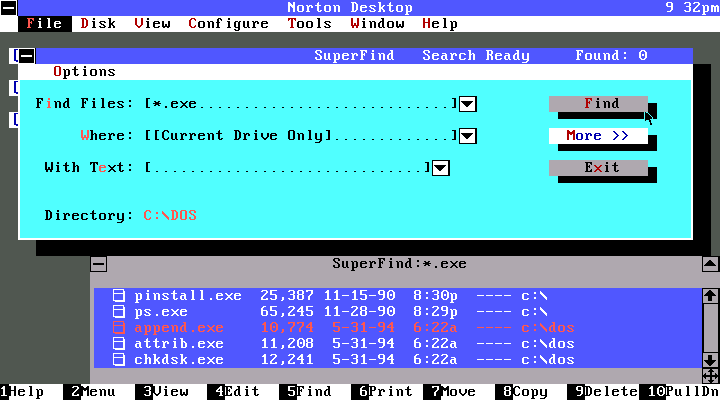 From within the desktop, you can perform various system actions such as format and copy floppy disks. 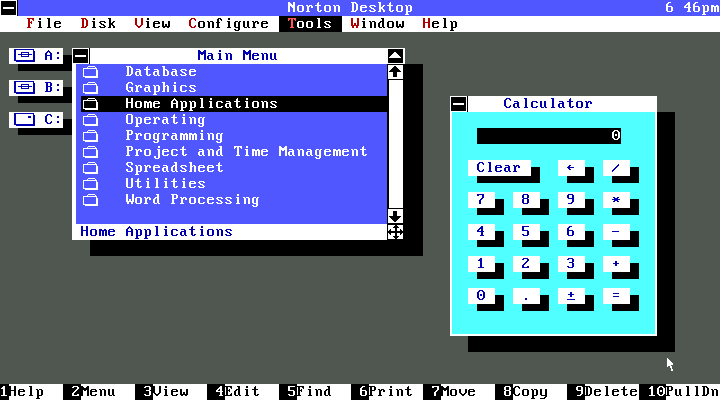 Several built-in accessories include a program menu, a calculator, and a calendar. 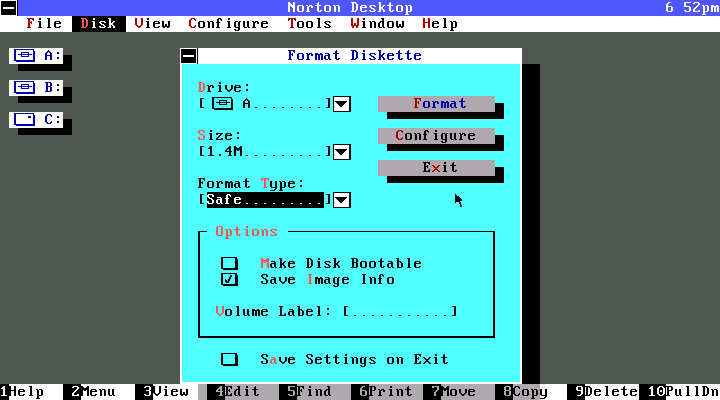 Norton Desktop for DOS bundles a number of Norton applications including: Unerase, Speed Disk, Disk Doctor, Remote Link, Norton Backup, Norton AntiVirus, Norton (MCI) Mail, System Information, and Norton Scheduler. All that, and it has a screen saver with a number of different screen saver modules.